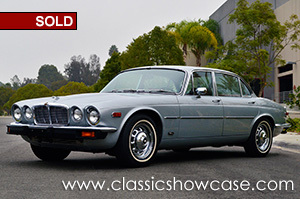 (SOLD) This well preserved and very stylish XJ6L is a Southern California car since new, and has spent it's entire life in the Western region of the United States. It has benefited from a strong maintenance history, and has received a full service and detailing by Jaguar specialists at Classic Showcase. The Jaguar XJ6 was introduced in September 1968 and completely changed the Jaguar saloon car range. The car's impact is still felt by the company today. With the original Series 1 Jaguar XJ6 the Browns Lane company created a single range of cars to replace the Jaguar Mk2, S-Type, 420 and 420G. Jaguar's plan was to drop these cars within two years and focus its entire saloon car fortunes on the new car. So it had to be right. Under the dynamic leadership of Sir William Lyons, Jaguar designed a car that reflected its heritage but moved the saloon car game on considerably. Jaguar buyers wanted space, pace and grace. They wanted class and pedigree. They chose a Jaguar because it was more youthful and stylish than a Rover. The Jaguar MK2, S-Type and 420 appealed to them and gave buyers choice, but multiple models meant costly production implications for Jaguar. Jaguar conceived the XJ6 as a replacement for all of these cars in order to simplify its production line and focus its product offering. The XJ6 had to excel in every one of the main areas that mattered to customers - looks, comfort, space and handling. It is a reflection of the single-minded approach of Sir William Lyons that Jaguar succeeded and produced a car that, even 40 years on, is very difficult to fault in any respect. A good XJ6 is smooth, quiet, beautiful, spacious and a joy to drive. The XJ6 Series 2 was developed to meet USA Federal Safety laws concerning bumper height. Jaguar lifted the front bumper and shortened the grille to create a front end that has become synonymous with Jaguars for the last four decades. The heating and ventilation system and the interior were also improved. The Series 2 was the most prolific Jaguar XJ6 version, and introduced a design style that is still current today; for many, the Series 2 represents the best blend of design purity, quality and reliability.